Finnish soprano Päivi Nisula has been a permanent member of the Finnish National Opera ensemble since 1993, when she was voted 'Opera Soloist of the Year' in Finland. She has since performed an extensive repertoire, including Waltraute in Götz Friedrich's Götterdämmerung, Jane Seymour (Anna Bolena) and notably Eboli and Azucena. 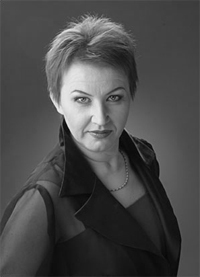 A graduate from the Sibelius Academy in Helsinki, Päivi Nisula started her career in the early 1990's as a mezzo-soprano, appearing in Tampere in the roles of Eboli (Don Carlos) and Fenena (Nabucco), as well as at the Savonlinna Opera Festival as Amneris (Aida). She also performed at the Royal Opera in Stockholm and returned to Savonlinna as Preziosilla (La forza del destino) in 1999 and 2000. In 1998, she won the Timo Mustakallio Singing Competition. Singing the role of Riitta in The Last Temptations, Päivi Nisula made the first steps towards further dramatic soprano roles. In 2002 and 2003 she sang Brangäne in a new Tristan und Isolde production at the Savonlinna Festival. In Helsinki, she made a spectacular role debut as Kundry in Harry Kupfer's Parsifal production, followed by Tosca and later on Desdemona together with Renato Bruson and Giuseppe Giacomini. In concert, Päivi Nisula has performed in Scandinavia, Germany, Spain, Malaysia, and the USA, including Arnold Schoenberg's Gurrelieder in Berlin and Leipzig with the MDR Symphony Orchestra, Mahler´s 2nd Symphony in San José, Eritheia in Manuel de Falla's Atlantida and Sibelius' Kullervo in Tokyo (2004), Kullervo with the BBC Orchestra in Glasgow and Birmingham (2006) and together with the Minnesota Orchestra in Minneapolis and New York (2010), as well as Mahler's 8th Symphony in Madrid (2007).